Home News & Opinion Commentary Super Bowl LI was a good game. Let’s remember that. Super Bowl LI was a good game. Let’s remember that. 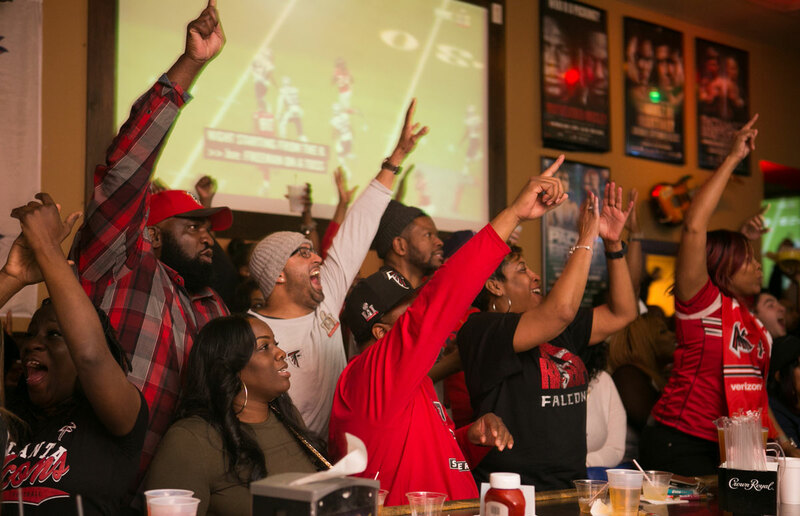 Atlanta Falcons fans cheer at Dugans during Super Bowl LI. “Bombs Over Baghdad” played on the speakers—all five of them, plus two amps and subwoofers. “I mean, ATLiens really is Outkast’s best album,” said Jamil Ficklin, sporting his Julio Jones jersey among a sea of other ruby-red Julio Jones jerseys at Dugans in Poncey-Highland. Then Pastor Troy’s “No Mo Play in GA” started up, and everyone chanted along with the chorus: “We ready, we ready.” An elderly man who had, up until that moment, been calmly enjoying his cigar, leapt to his feet and swayed, punctuating his moves with flicks of his wrists. It was just like a really good house party, I was told, but with a few 1500-watt fog machines. “You picked the best place to come,” said Jamil’s little brother. “This is Atlanta.” Super Bowl LI hadn’t even started yet. Jamil looped his logoed acrylic scarf around my neck, Devonta Freeman busted a 37-yard run on the opening play, and, by halftime, the score was 21-3, Falcons. Nene lost his breath when Robert Alford intercepted Tom Brady to score an 82-yard touchdown, the second-longest in Super Bowl history. The funniest moment of the night was when Lady Gaga took the stage. That seemed to be the disco nap signal to the Dugans crowd. Those who weren’t ordering another round or catching up on texts stared up—unimpressed, slightly befuddled—at the TV screens as Gaga stomped and roma-ro-ma-ma’d. The world wanted to be shocked by the Falcons, who hadn’t been to the Super Bowl in nearly 20 years. My friends—well, the ones who weren’t from Boston—wanted the dirty birds to win; Bill Maher doesn’t give a damn abut football, and he wanted them to win; and, according to a Public Policy Polling report, 53% of Americans wanted them to win. Everyone loves an underdog, and a lot of people dislike President Donald Trump, to whom Patriots coach Bill Belichick, quarterback Tom Brady, and owner Robert Kraft were all reportedly linked in news stories leading up to the big game. As I wiggled my way to Dugans’ front door, which opens onto Ponce de Leon Avenue, Brady found Malcolm Mitchell just beyond NRG Stadium’s first-down marker on third-and-11. Back inside the bar, a Falcons fan got physical with a Patriots fan (there were a couple), and someone shot off a can of pepper spray. People spilled out onto the sidewalk, hands over their mouths, as I waited on the same curb for my ride home—and as Brady passed to Danny Amendola for a six-yard touchdown. The lights in my office parking lot were down this morning. I rolled into a space in the dark, and walked from there along Peachtree Street, the quietest I’ve seen it, to work. The city needs a minute to mourn. What I’ll remember about last night was the electric energy coursing throughout Dugans from 6:30 to 9:30, and how all those red jerseys swayed in unison. It was a good game. Let’s not forget that.